One of the better known public buildings in Little Rock during the first seven decades of the 20th Century was the school house on Sherman Street between 7th and 8th streets. 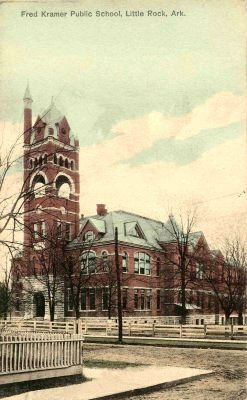 The building, completed in 1895, was named the Kramer School in honor of Frederick Kramer, a civic-minded German immigrant who served on the Little Rock school board from February 1869, when the school board was first created, until he retired in 1894. During almost all of those twenty-six years, he was elected by fellow board members to chair the board. The handsome Kramer School building on Sherman street was not the first school in the city named in honor of Frederick Kramer. Another school built in late 1869 and early 1870 was also called the Kramer School (sometimes it was referred to as the Ward 1 school). The first Kramer school was located near the eastern end of Second Street between the mansion built by Alexander George in the 1840s and the high banks of the Arkansas River. 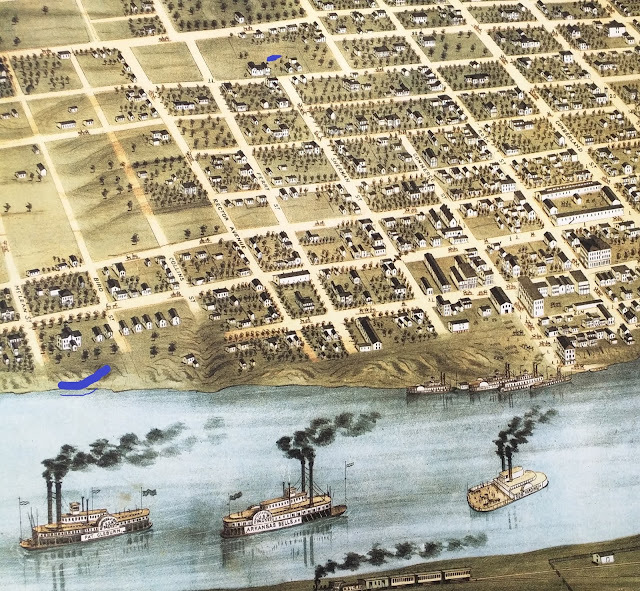 was located by the Arkansas River on the left side of the map (above the blue mark). The spot where the second Kramer School was built is marked by a blue tick at the top of the map. [The school] presents more of neatness and comfort than any similar building in the city. There are but three occupied rooms at present. The first we entered is in charge of Miss Foster, who is now in her second year as a teacher in our schools. As we entered, Miss Adella Thomas was giving a less in music. The pupils were very apt, and displayed considerable skill. Miss Thomas is the teacher of music for all the schools. Leaving this room, the next we entered was in charge of Miss Fishburn. The recitations we heard were very fair. In the next room, Mr. Mason is the teacher. He is also the principal of the school, a finely educated gentleman, and said to be a very fine teacher. Sadly, just three years later, on October 30, 1873, the school building burned to the ground. The fire started at about noon in the basement, where two furnaces were located. The Gazette attributed the fire to the “inattentiveness of the firemen [who tended the furnaces].” The city’s volunteer fire departments responded quickly to the fire, but were unable to get water from the Arkansas River because of the high banks or from the nearest public cistern, located several blocks away at the corner of Markham and Commerce streets. One department did extract some water from the cistern in the school yard, but the amount was too little to stop the fire. The destruction of school came at a particularly bad time. Little Rock, like the rest of the nation, had been hit by a major recession and tax collections had plummeted. 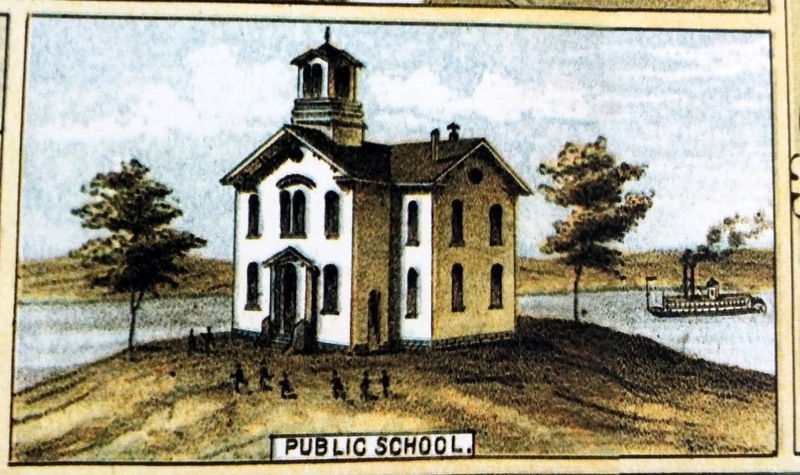 During that 1873-74 school year, the board struggled to obtain funds to pay teacher salaries, and it considered closing city schools three months early. However, even though local lenders refused to buy the school district’s notes or bonds, Kramer found investors in Cincinnati who would, and the schools borrowed enough to remain open for the full school year. The recession continued in the following years, and the district had little money to rent classroom space much less build a new school. It had to sell much of its real estate, including the land on which the Kramer School had sat, to help pay for teacher’s salaries and cover its debt. It took almost three more years, and heated controversy, before the school district finally built a new school on the east side, and despite the original plans for it to be used to educate African-American students, the board decided to make it a white school and let the African-American students use the space that was left vacant by the white students going to the new building. Unlike the short-lived first Kramer School building, the second has had a long and fruitful existence. It served as a regular school building until 1969. Then, from 1969 to 1978, it hosted an experimental school operated by Bettye Caldwell of the University of Arkansas at Little Rock’s Center for Early Development and Education. After that program moved to a new school building in 1978, the Kramer School building sat vacant for a couple of decades, then was sold to investors who, through renovation, carved it into loft apartments. The building still stands (without the original tower in front) as the Kramer School Artist Co-op Apartments. A few blocks to the northeast of these apartments, the land on which the first Kramer School was located now is part of the grounds for the Clinton Presidential Library and Museum. School Board. Daily Arkansas Gazette, January 11, 1870, p. 4. Our Public Schools, Daily Arkansas Gazette, November 26, 1870, p. 4. Destructive Fire. Daily Arkansas Gazette, November 1, 1873, p. 4. School Board. Daily Arkansas Gazette, January 28, 1877, p. 4. Francis Jones. Local System of Schools is the First Formed in State. Arkansas Democrat. May 20, 1916, p. 3.